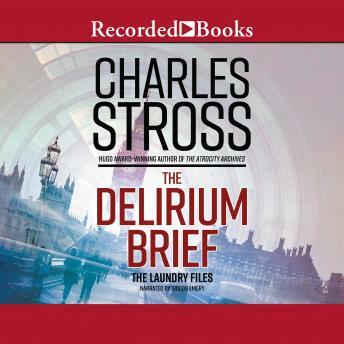 The eighth case in Charles Stross' Laundry Files, the Hugo Award-winning series described by Kirkus Reviews as "a weirdly alluring blend of super-spy thriller, deadpan comic fantasy, and Lovecraftian horror." Bob Howard's career in the Laundry, the secret British government agency dedicated to protecting the world from unspeakable horrors from beyond spacetime, has entailed high combat, brilliant hacking, ancient magic, and combat with indescribably repellent creatures of pure evil. It has also involved a wearying amount of paperwork and office politics, and his expense reports are still a mess. Now, following the invasion of Yorkshire by the Host of Air and Darkness, the Laundry's existence has become public, and Bob is being trotted out on TV to answer pointed questions about elven asylum seekers. What neither Bob nor his managers have foreseen is that their organization has earned the attention of a horror far more terrifying than any demon: a British government looking for public services to privatize. There's a lot of potential shareholder value in the Laundry's "knowledge assets." Inch by inch, Bob Howard and his managers are forced to consider the truly unthinkable: a coup against the British government itself.